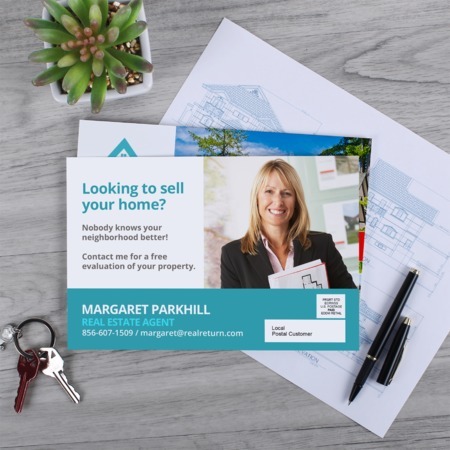 Direct mail postcards' available finishes include matte, gloss, and high-gloss UV. You also have the choice to use standard EDDM® retail indicia, or to have your indicia on your artwork file. Together, these options allow you to create quality postcards in EDDM® compliant sizes and formatting that suit whatever artwork you have. Optional bundling in sets of 100 is also available to meet USPS requirements for EDDM. Ordering EDDM® compliant postcards is easy, if you choose a professional EDDM® printer. Download our postcard templates and mailing guide in the size and file format you need. Use these templates with your preferred design tool to account for the bleed, trim, and safe zone for your artwork, as well as to account for technical mailing requirements. When you’re ready to print, just select the options you need, and upload your file. You can get your finished EDDM® postcards in as soon as 1 business day and start selecting postcard mailing delivery routes at your local post office. UPrinting is an independent provider of Every Door Direct Mail® products that is not associated with nor sponsored by the United States Postal Service.